8 chicken thighs or whatever parts you like best. Stir the first 7 ingredients and 1 teaspoon red pepper flakes in a large bowl to blend. Whisk in 1 1/2 teaspoons of salt and 1/2 teaspoon of black pepper. Set the salsa verde aside. Place the chicken in a 15 by 10 by 2-inch glass baking dish. Rub the minced garlic, remaining 2 teaspoons of salt, 1 teaspoon of black pepper, and remaining 1 teaspoon red pepper flakes all over. 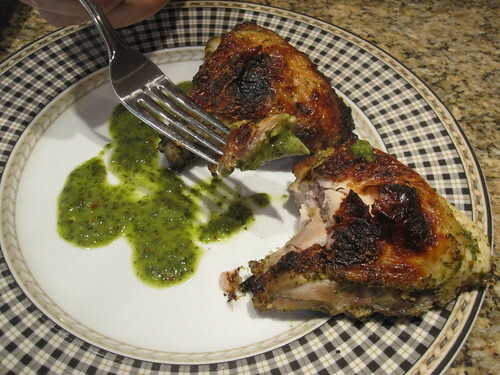 Pour 1/2 cup of salsa verde over the chicken, turning to coat evenly, cover the dish and remaining salsa verde separately with plastic wrap and refrigerate. Broil or Grill the chicken about 40 minutes. Transfer to a work surface and let rest 15 minutes.